You have an aquarium and you plan on getting a filter, a canister filter to be exact. A canister filter is just one of the different types of aquarium filters available. The canister filter helps maintain your aquarium’s healthy environment when the water that flows into it through an intake pipe passes through the filtering material inside the canister and is then pumped back to the aquarium through a return pipe. A filter plays an important role to an aquarium’s upkeep. Its purpose is to clean the water of the aquarium of toxic elements that causes harmful buildup of ammonia and nitrates which may come from different sources. Nitrates are harmless in small amounts, but if left unfiltered or unmanaged, you will be risking the health of your fishes. Your fish or other aquarium inhabitants such as turtles constantly excrete wastes. Uneaten food, decaying organic matter, dead plants, and other external particles contribute to tank pollution and deterioration of the water quality. These toxic elements can be removed by an aquarium filter. It also provides aeration. Overall, an aquarium filter such as the canister filter provides lasting, positive, and essential benefits for your tank inhabitant’s health. There are different types of aquarium filters available, these are the Wet/dry filter, Undergravel filter, Internal filter, Power filter, and the Canister filter. These filters employ three filtration method which are the biological filtration, mechanical filtration, and chemical filtration. Biological filtration takes place when bacteria in the tank breaks down the dangerous ammonia and converting them to nitrites which is then converted to the less toxic nitrates. Mechanical filtration involves the physical removal of harmful and toxic materials. The other filtration method, the chemical filtration, uses a filter media such as activated carbon to remove pollutants and harmful wastes. The canister filter is one of the more popular types of aquarium filters. The filter media is kept inside a canister where water from your aquarium is being pushed in and out via ﻿an electric pump. This process removes the wastes, debris, and contaminants from the water. A standard canister filter offers the option of customizing your filter media that you put on its basket, cartridge, or media bag. There are different kinds of filter media that suits the specific cleaning needs of your aquarium. There are biological, mechanical, and chemical filtration available. These can then be placed inside the slots of your canister filter. Canister filters are ideal for medium to large-sized tanks and they can provide high-volume filtration. Canister filters are sealed, so they can have higher flow rates and more filtration stages compared to other types of filters. It also saves internal space and can be disconnected from the tank for cleaning and maintenance without causing disturbance to the tank’s occupants. It runs quietly and has an increased biological filtration. A canister filter gives you the option of flexibility when it comes to choosing your filter materials that is best for your aquarium. Usually canister filters offer 2 to 4 filter slots or compartments. The disadvantages of using canister filters are that their prices can cost you more money when purchasing. It is also larger than an HOB power filter. But aside from those, a canister filter is a good choice. Aquarium inhabitants – Its compatibility with your tank’s inhabitants since smaller fishes can be sucked inside a canister filter. Aquarium water type – It should be compatible for your tank’s water type, either it is of freshwater or saltwater. Flow rate - May be in LPH or GPH. Capacity – Choose a filter that targets at least targets twice the volume than your actual tank size. Media - Check for the different types of filter media that can be inserted. Pump Output - Given in Watt. Working voltage – Check for the compatibility with your area’s supply voltage. Priming Option – Check for the canister filter’s priming option, ideally it should be self-priming. Availability of spares – Replacement for spares should ideally be available and inexpensive. Maintenance – Check for the difficulty level of the canister filter’s maintenance and serving process. Warranty on product – Choose a canister filter that comes with a product warranty for security in case you’ll encounter problems with it. Before we show you our list of our top 5 canister filters, check out this video to guide you in choosing the right canister filter for your aquarium needs. 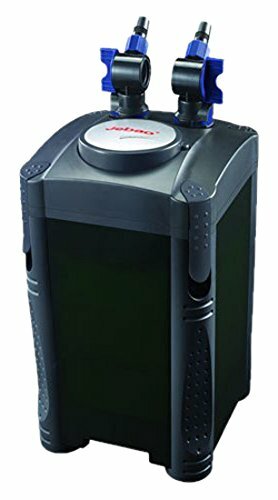 This canister filter from Jebao has advanced and high-performance features that help ensure high water quality plus quick and easy routine filter maintenance. You don’t have to worry if this canister filter is compatible with your aquarium tank because it is ideal for an aquarium fish tank for both freshwater & saltwater types. It also works well for aquatic turtle tanks. This product offers an enhanced aquarium filtration with its large-capacity 4-stage filtration (4-basket) system and a single press option to primer. Its revolutionary canister filters boast greater media-storing capacity so aquarium water comes into contact with more filter media during the initial pass. The dimensions of the filter (with valve attached) are 8.1" x 8.1" x 18". Its voltage is 110-120v 60 Hz and comes with a 2-prong US plug. The max flow rate is 320 gallons per hour. Its filtering capacity is up to 8.1 liters. This canister filter is recommended for tanks with the size of 60-100 gallons. The media kits included are carbon, bio ball, ring and blue pad. No leaks from the filter. Great one pump prime option. The Hydor Professional External Canister filter is introduced with an intelligent and space saving design. This filter offers maximum performance and extraordinary versatility. It has an extra-large priming button that makes this product easy to use. 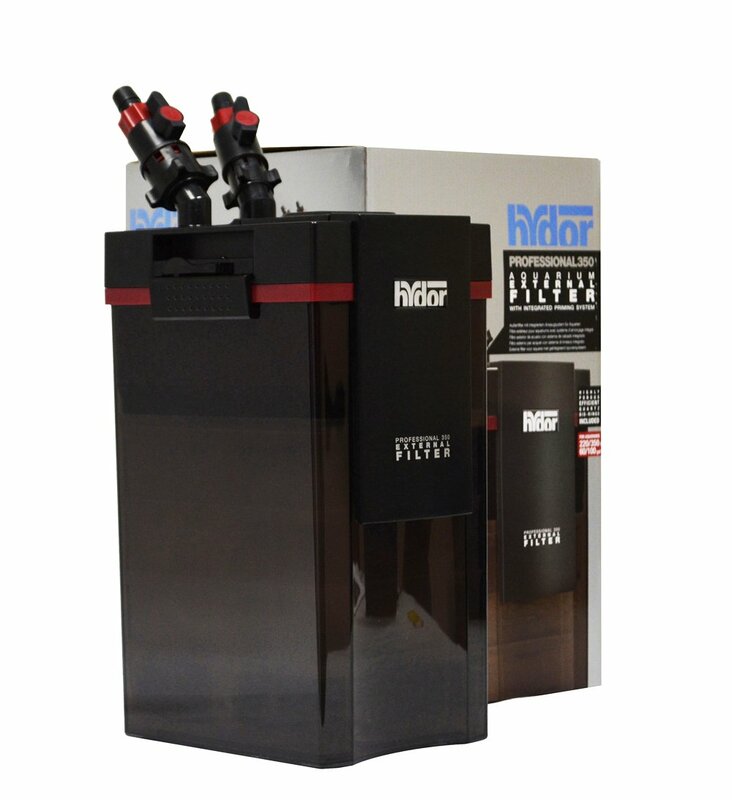 Hydor Professional Canister Filter is useful for all aquariology enthusiasts. It comes complete with all media needed, with the exception of carbon which is sold separately. The features include a telescopic intake tube and your option of an adjustable angle flow return or expandable spray bar. Separate intake and output water flow control. The EHEIM Classic External Canister Filter with Media has a tried and tested technology and high level of efficiency even for larger systems. The mechanical-biological purification is achieved in a single process with constant water circulation and simultaneous oxygen enrichment. The 2211 model is compact in size and comes complete with a stand. This product has a permo-elastic silicon sealing ring fixed on the pump head for easy and safe closing after cleaning. It is equipped with filter sponges and/or loose filter media and comes with accessories such as spray bar, inlet pipe, hose and installation accessories. It also comes complete with filter media (EHEIM Mech & Substrat Pro) and valves. No water splash after water level drops. Intake can be lower into the tank. Easy cleaning and filter media changing. Air getting stuck in the filter. 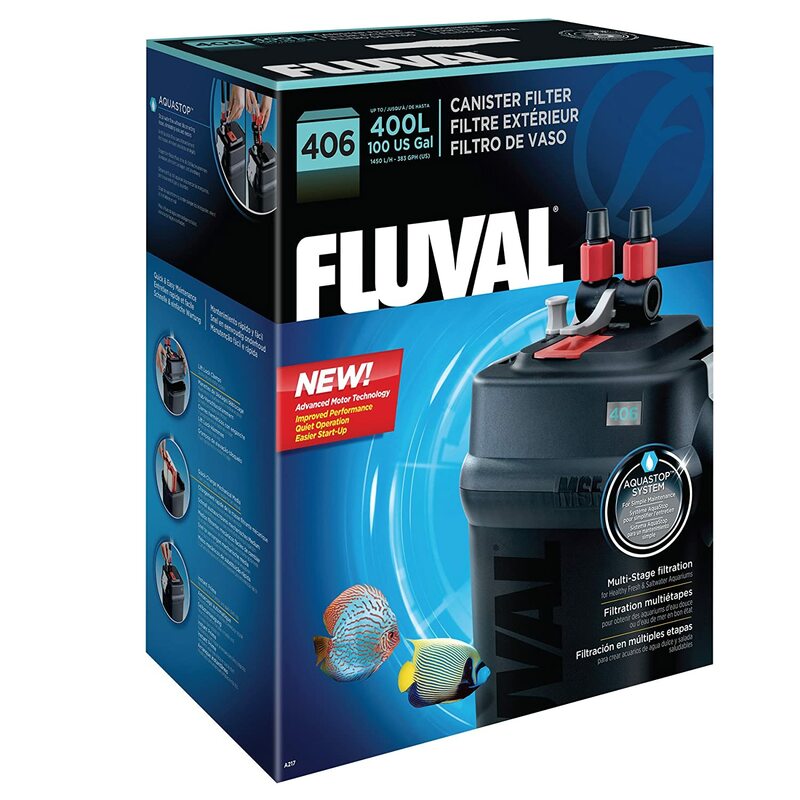 The Fluval External Canister Filter aquarium boasts a new and more powerful motor that adds extra convenience. Each Fluval Multi-Stage 06 Series Filter adds even more user-friendly features to ensure aquarium filtration is even easier to set up, customize, and maintain. It provides filtration for aquariums up to 400 Liters (100 U.S. gallons) with a flow rate of 1450 L/H (383 US gallon per hour). Each filter holds 35-50% more volume than round canisters of similar size and directs filtration through a complex flow path to maximize contact with the filtration media. 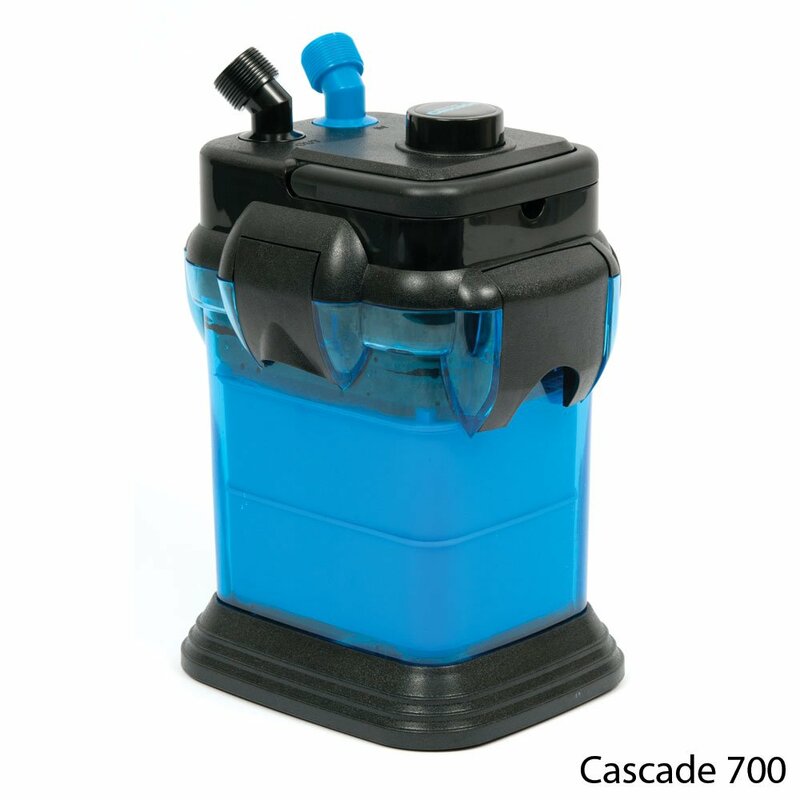 It features the patented Aqua-Stop Valve which permits hose disconnects and easy-open, one-motion lock clamps makes routine cleaning and maintenance easy, multiple filtration baskets, and rim connector assemblies to keep the intake and output hoses in place on your aquarium. Multiple filtration baskets are already packed with the necessary media for mechanical, chemical, and biological filtration. Four distinct sizes - each with increasing flow rates and filter capacities - to suit any small to mid-sized home or commercial aquarium. Simple locking and unlocking mechanism. Leakage problem after power outage. The Penn Plax Cascade Canister Aquarium Filter offers a heavy-duty and multi-stage external filtration for your fresh or salt water aquarium. This canister filter can handle aquariums up to 65 gallons efficiently providing up to 185 gallons per hour of flow. This filter is easy to install and comes with all the necessary accessories. It has a quick push-button primer, two independent directional 360-degree rotational, flow-rate control valves and swimming pool-style hose clamps. The sturdy rubber mounted tip-proof rubber base keeps the unit in place. Each pump comes with large filter trays, start-up filter media & input/output tubing. An air-tight seal assures proper flow rate while maintaining ultra-quiet operation. The easy-lift clamps make it simple to release the vacuum and remove the top for changing media or other maintenance. Directional returns help to suspend waste matter so it can be taken in by the filter. Large filter trays for any filter media. Strong and secure hose connections. Adjustable flow rate. Runs quietly. Issues with the spray bar. Choosing the best canister filter for your tank can be such a task. We hope that we were able to help you with our list of the top 5 canister filters. Out of the list, we highly recommend the EHEIM Classic External Canister Filter with Media. It’s quality and features makes it appealing to us. The easy servicing and maintenance process made it possible to be our top choice. But regardless if you agree with us or not, we hope that you find the best canister filer to keep your tank thriving and healthy. Otherwise, you can check 2 detail reviews of Fluval 306 and Fluval 406​ filter.